Le Blanc Spa Resort is a Cancun luxury all-inclusive beach hotel. It appeals to sophisticated, upscale travelers who are looking for an adults-only hotel with refined style. Le Blanc is among Cancun's best two or three hotels – and it's a very competitive field. The hotel possesses the rare AAA Five Diamonds hotel rating. Le Blanc Spa Resort is the pinnacle of hotels in the Palace Resorts family. The property was formerly another hotel brand. It was redesigned in 2004 by top Mexican architects. • Its modern look contrasts a brilliant white building against azure sky and turquoise sea. This handsome hotel is an inspired choice for luxury travel to Cancun. 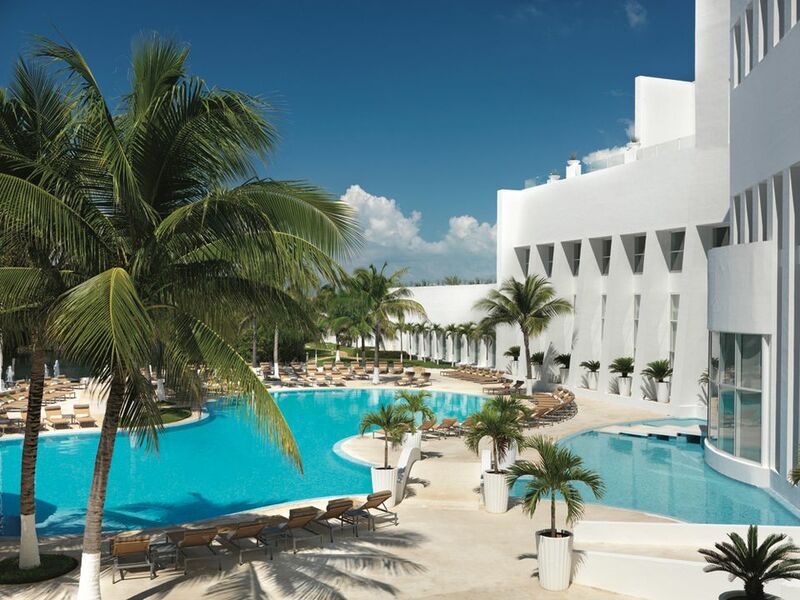 Will You Like Le Blanc Spa Resort, a Luxury All-Inclusive Hotel in Cancun? Le Blanc's rates are all-inclusive; there is no "a la carte" payment option. An all-inclusive rate means one set price for everything. Private butler services like unpacking/packing, laundry, etc. Free yse of the spa's hot tubs, sauna, steam, foot baths, etc. The hotel is small enough to feel friendly and social. Le Blanc is built on a compact (but not cramped) property. Everyplace you want -- beach, pools, decks, dining, spa, gym -- is quickly reachable by elevator or a few steps' walk. Le Blanc rooms and suites are set in six floors circling a central atrium: no boring long corridors here. Le Blanc's accommodations include 250 good-sized rooms, many with balconies, plus 14 even larger suites. All rooms have a beach and water view. About two-thirds of rooms face the Caribbean. Lagoon-view rooms face the equally azure Nichupte Lagoon – and the sunset. In short, Le Blanc rooms do not skip or skimp on any room luxuries. Housekeeping and butler service is impeccable. Dining is a highlight at Le Blanc Spa Resort Cancun. Its five restaurants are beautiful, with indoor-outdoor dining and fresh, chef-cooked food that tends to be healthy and light. Le Blanc has several dinner-only upscale restaurants, with seating by reservation (and a dress code: no shorts, no no-flip-flops). The resort's wine cellar is vast and sommeliers knowledgable. Lumiere: Le Blanc's French fusion restaurant, has a chic, modern look to go with its contemporary French cuisine. Blanc Italia serves food from The Boot. Blanc Asia srves specialties from Japan, China, and Thailand. The seductive setting recalls a Shanghai nighclub circa 1928.
overlooking the Caribbean and Le Blanc's infinity pool. Set by the beach and pool. Le Blanc has its quiet, romantic side -- and its active side. Active guests relish the hotel's spa, pools, beach, gym, and other recreational offerings. The top treatment room: the Golden Spa Suite, "a spa within a spa"
A varied spa menu offers a vast range services for women, men, couples, athletes, moms, and so on. The spa's varied health pools and tubs are complimentary to guests without a spa appointment. This hydrotherapy circuit is fun and a must-visit. Gentle, crystal-clear, turquoise waters nearly always around 82 degrees F.
Roving beach butlers furnish snacks, cocktails, water, iced towels, SPF, etc. Three large, inviting pools are the daytime focus of many guests. As is common in the travel industry, the Luxury Travel Expert was provided with a complimentary visit in order to describe the hotel. For details, see our site's Ethics Policy.